The only consistency among each of the projects discussed in this article is in their inconsistency of design approach and resulting aesthetic effect. The passive house approach is neither limited by building function nor climate as will be seen below. The first ever certified passive house was built almost two decades ago, creating a legacy of some 30,000 projects in all corners of the globe. This article presents some of my favourite passive house projects, most of which I’ve had the great pleasure of experiencing in person. The projects described below include an international award winning multi-family residence, a relaxed and rolling Montessori school, a massive office project complete with kinetic effect, a model of simplicity in single family home design in the US, Asian innovation achieved in Japan with a strong Irish connection, and an Olympic village project in Austria. I hope you enjoy the selection. 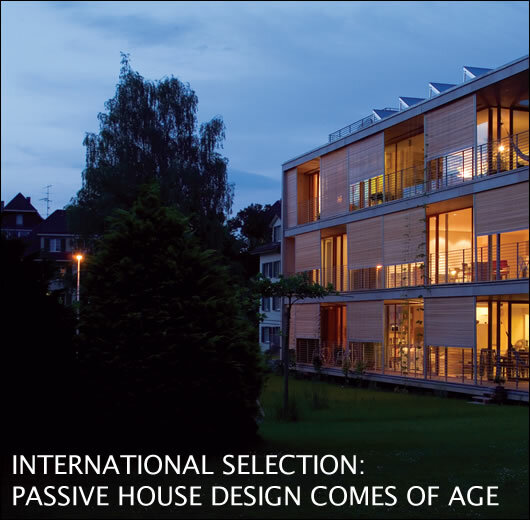 This project lays claim to the enviable status of being the inaugural winner of the 2010 International Passive House Architecture Awards (‘Architekturpreis’) run in parallel with the global Passive House Conference. Unlike the conference which runs annually, the awards will take place every three years so this project will rest at the top for another two years or so. 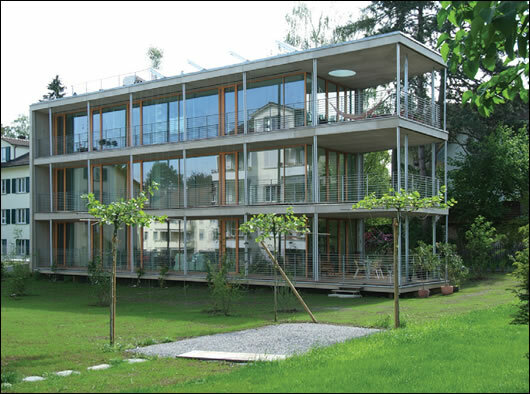 This 2006 project was designed by Halle 58 Architects in Bern and comprises a multi-family ‘house’ with three apartments. What is striking about this project is the sheer extent of floor to ceiling glazing, which provides a light airy feeling both internally and externally while also achieving incredible comfort and miniscule heating bills. The design approach dismisses any misconceptions there might be about the need for heavy opaque elements with windows limited to south-facing facades. 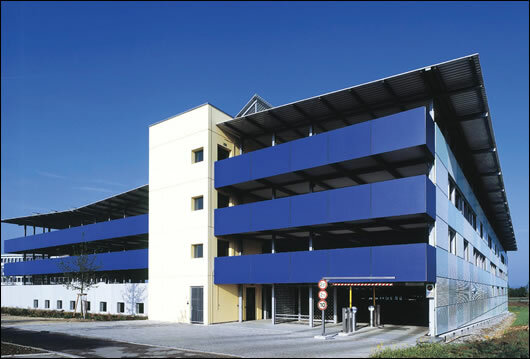 External retractable shades as well as thermal mass in the floors protect against overheating – the shades adding a dynamic effect to the façade. The internal layout is completely open plan providing the tenants with opportunities for flexibility in subdivision and adaptability over time. 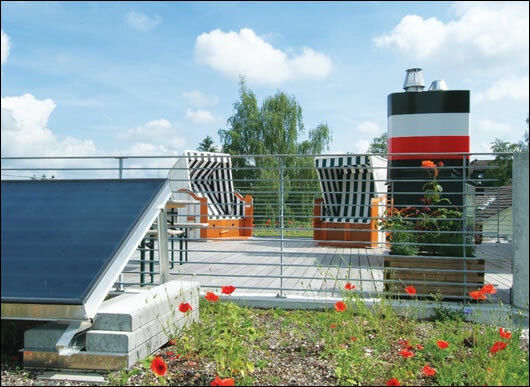 The roof is stacked with both solar thermal as well as photovoltaic panels and auxiliary heating is provided by a wood pellet boiler feeding an underfloor radiant system. This project is not just passive house standard, therefore, but close to being a carbon neutral project too. 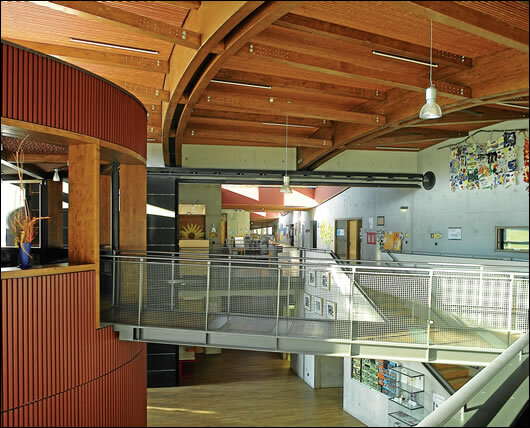 This wonderful school project is one of my all-time favourite passive house buildings, quite simply because it breaks most of the preconceived expectations people have about this exacting performance standard. The two-storey school is located close to Munich on the fringes of a small settlement and set in the context of fertile farmland. 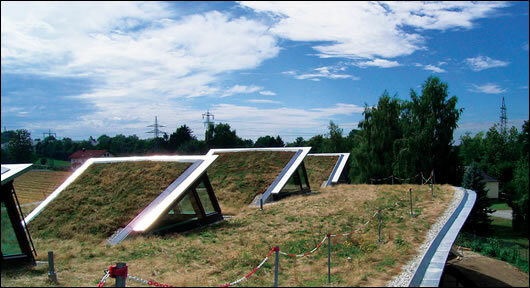 The grass roof of the school undulates in form, eventually rolling down and running into the fields below. The landscape and building thus seamlessly converge with the use of this magic carpet, both changing with the shifting seasons. The building also curves in plan, on both northern and southern elevations. The architect, Gernot Vallentin, beams proudly that the building cost no more to build than conventional construction, achieved through the use of some very clever design gestures. One of these is the use of what might be described as ‘centipede’ legs which facilitate fire-escape stairs connecting each of the upstairs classrooms with the garden below. Use of such stairs obviated the need for costly fire protection measures – and the money saved was spent instead on the thermal envelope. Expansive rooflights punctuate the rolling roof, providing ample natural daylight onto the central corridor below. Herr Vallentin describes this corridor as a kind of streetscape, from which you can look through ‘shop windows’ to the flanking classrooms. 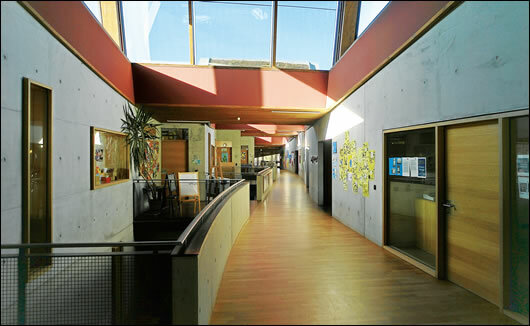 The street and esplanade above are expressed in polished concrete, a clever design which achieves the thermal mass necessary in passive house schools in order to modulate temperature fluctuations. This project illustrates that the passive house standard clearly does not require a Rubik’s Cube design approach, but in fact leaves ample room for organic expression. The high air quality in passive house schools is well reported and some cities including Frankfurt have mandated this approach as the base standard for all school projects. Two passive house schools are currently under construction in Ireland. This office project in Ulm designed by Stefan Oehler, measures approximately 5,700 square metres and at the time of construction was the biggest passive house building on the planet. On visiting this project 18 months ago on a hot summer’s day, I was fascinated by the kinetic effect created by the external blinds winking and blinking as the sun rotated around the building. 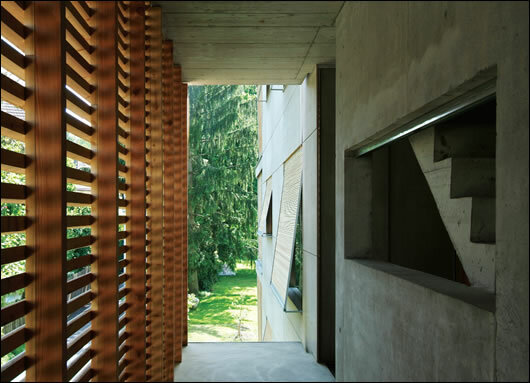 When a given façade is in full sun, the bottom two-thirds section of the blinds automatically close, reducing solar gain and the risk of overheating (a potential concern in offices due to the high internal heat loads). As facades come into shadow, the blinds open fully again allowing natural daylighting into the offices. 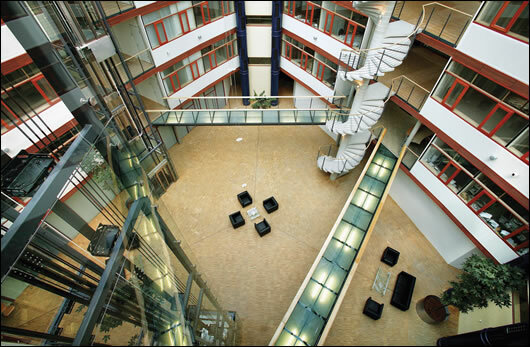 The footprint of the building is best described as a convexly curving triangle, enclosing a bright and airy central atrium. A centerpiece in the atrium is provided by a series of the blue perforated columns which deliver almost 30,000 cubic metres of fresh air per hour. These wind-pipes breathe life and health into the offices and express one of the core elements of the passive house, namely heat recovery ventilation. In section, the facades also curve in form, and from some aspects resemble a giant ocean liner. 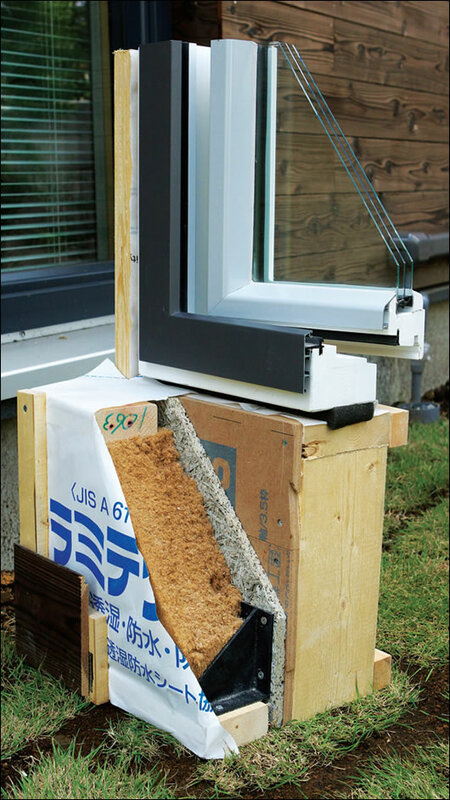 This concept is perfectly fitting for a passive house building, which provides a steady indoor climate through the year irrespective of what weather conditions are thrown at it. Passive house projects are hard to throw off course, no question. At the time of visiting this project, the entire facility was fully occupied with happy long-term tenants enjoying the full benefits of all that the passive house standard has to offer. Vacancy rates in the surrounding business park were running at 30 to 40%, rendering this project a great investment. Incredibly the project was built at zero additional cost, with payback kicking in on day one. This project provides an excellent example of how the passive house standard can be achieved at any scale and any design form. The passive house standard is now truly a global phenomenon, and this project is the first certified passive house in New York, a climate which presents the double-whammy challenge of very cold winters and scorching humid summers. Similar to a thermos flask, Dennis Wedlick’s design keeps the indoor climate cool in summer and warm in winter. The entire southern façade is glazed but there is no risk of overheating in summer due to the deep overhang. 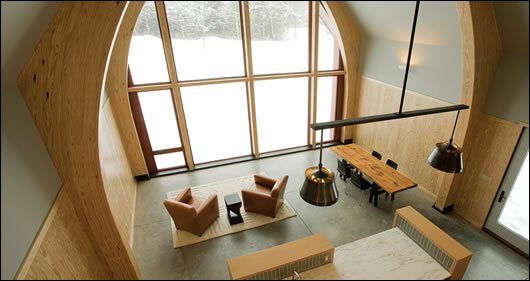 The building is thus a manifest expression of clever solar design, an approach which has a long history in the US. The main living space is double height and the lofted ceilings in combination with exposed beams and fully glazed gable create a light filled effect. External finishes predominantly include the natural materials of roof shingles and rock cladding, which help to integrate the building into its surrounds in this rural part of upstate New York. We have recently used this building as a case study in our training courses in New York, especially in the application of the Passive House Planning Package. Architecturally, the project is the epitome of simplicity and provides an excellent reference case when faced with achieving sustainable design in both hot and cold climates. 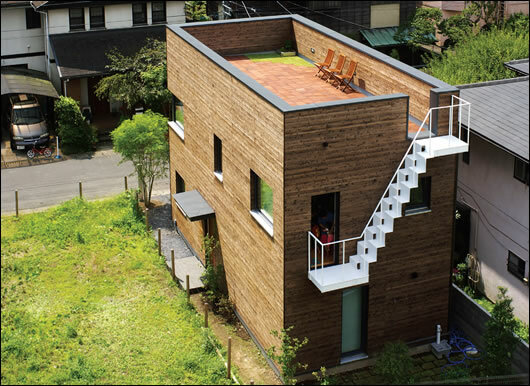 This passive house project was built in Kamakura, near Tokyo, in Japan and designed by Miwa Mori of Key Architects. 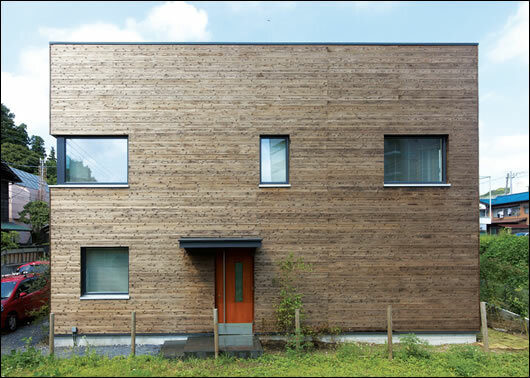 This is the first certified passive house in Japan, a hugely challenging sub-tropical climate in terms of both annual temperature swing and humidity. 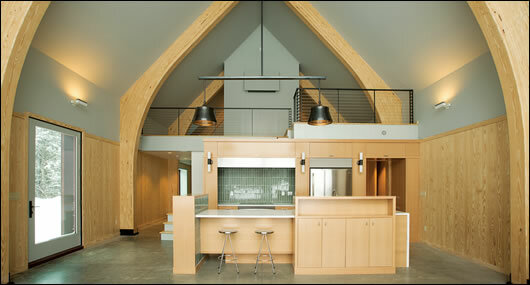 Other challenges faced on a daily basis by Japanese architects include the threat of termites as well as earthquakes. We don’t know how lucky we are here in Ireland. 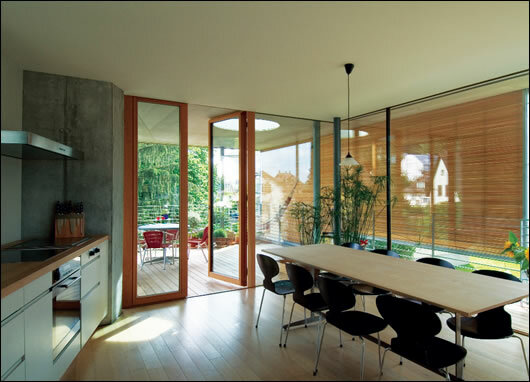 This project won joint second prize in the 2010 International Passive House Architectural Awards, well deserved due to its simplicity of form and clever use of a limited site area in terms of indoor and outdoor living. Sleeping quarters are provided on the ground floor, with living and dining upstairs making the most of natural daylight and views over a nearby wooded valley. A discrete metal stairs connects the living space with an enclosed rooftop terrace. The project makes the very best of the site, therefore, and is a model of how compactness need not compromise quality of life. In terms of form and aesthetic, the home appears as a tall wooden crate, clad in charcoaled cedar and with holes punched mostly in the top floor to make the best of elevated views. The contemporary design provides a wonderful contrast to the traditional neighbourhood architecture and illustrates that passive houses can fit in any context and in any climate. Miwa Mori, the Architect for this award winning project, worked at MosArt Architects in Wicklow where she learned the principles of passive house design. I had the great pleasure of reconnecting with Miwa at the Passive House Conference in Innsbruck and it’s clear that she is bringing innovation to Japan in terms of sustainable architecture. 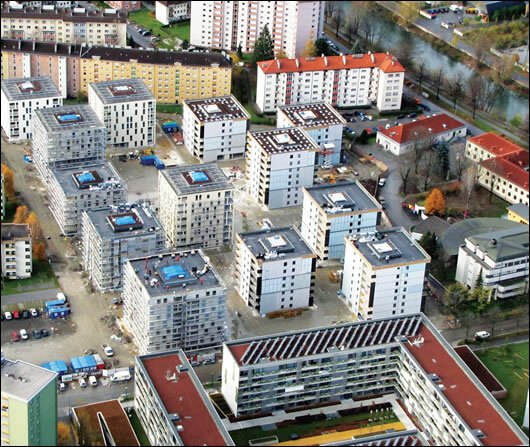 I recently visited this project as part of an excursion tour whilst attending the Passive House Conference in Innsbruck. This development – with 13 apartment blocks comprising a total of 444 apartments – was designed by Eck & Reiter Architects and din a4. 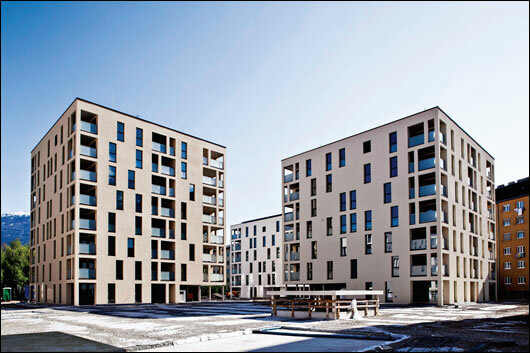 Set in a plain created by the Tyrolean mountainscape, the apartments quite literally glitter in the sunshine and provide a wonderful example of the massive potential for building large scale multi-residential projects to the passive house standard. The high-tech finishes used to clad these shiny cubes appear to change colour depending on the angle of view and direction of sunlight. Your eyes are deceived as you walk through the scheme and the effect is quite amazing – those clever Austrians, combining cost-effective passive house construction techniques with wonderful aesthetic effects. The buildings are crisp, tight, superbly detailed and perfectly fit for purpose as a village for the 2012 Youth Olympics. The glazing arrangement is slightly different for each block ensuring alternating characters but also reflecting the varying need for solar gain or shading. The lucky Olympians can come back and relax in high comfort and excellent air quality after a day of exertion on the slopes, and the heating bills are so tiny for each apartment that it simply doesn’t pay to install meters for billing. 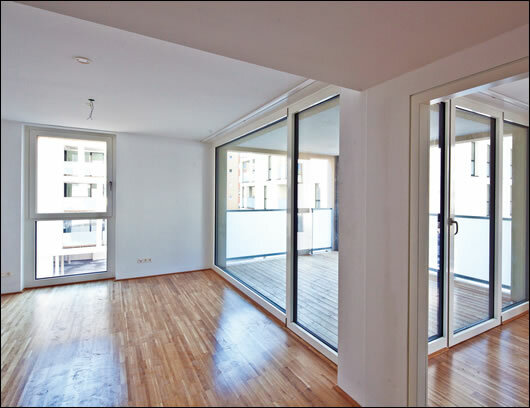 Inside, the apartments are light and bright, and many of them have a modest private balcony providing stunning views of the surrounding snow-capped mountains. The whole complex to my mind resembles a cluster of ice cubes carved from the glaciers above, glinting in the sun and weathering the winter blizzards with ease. I left truly inspired and confident that passive house has a great future. 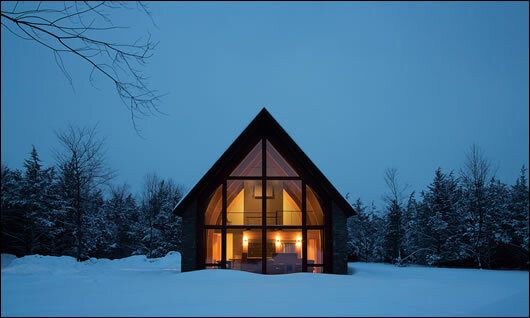 Why would you build to anything less than passive house, I asked myself – it makes no sense.